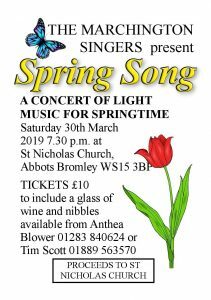 Our next concert will take place from 7:30pm on March 30th, 2019 in St Nicholas Church, Abbots Bromley WS15 3BP. Tickets are £10 and include a glass of wine and nibbles! Our Christmas Concert this year featured an evening of carols, songs and readings for the season of advent. 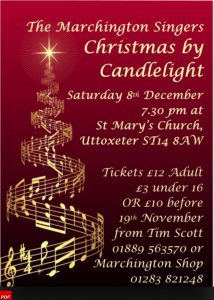 It took place at 7:30pm on Saturday 8th December 2018 in St Mary’s in the Marketplace church in Uttoxeter and was preceeded by mince-pies and mulled wine. Saturday, November 17th 2018 from about 12:30 we sang some Christmas music in the Sweet Little Cafe Courtyard to provide atmospheric support to the wonderful Courtyard experience. Applications are now being considered for our Student Bursary Scheme. Two successful students will be fully supported for 12 months through the provision of a range of musical experiences, through which they can develop their choral and solo skills. For further information and details on how to apply, please download our Student Bursary brochure here.